בכתבה הקודמת סיימתי בכך שסוף חודש מרץ 2010 נוצר בקע חדש ליד ההתפרצות הגעשית שהחלה ב- 20/3/2010, וכי החל להיווצר הר חדש ליד אותה התפרצות. אלה שכאן לא מסתיימת הפעילות הגעשית, ולמעשה היא ממשיכה גם ברגעים אלו במלוא עוצמתה, ואף גורמת לבעיות בתנועה האווירית בכל העולם, ובמיוחד במערב וצפון אירופה. בסופו של יום התפרצות זו השביתה את התעופה בעולם במשך למעלה משבוע. Jón Kjartan Björnsson, a pilot at Nordurflug told mbl.is that when he was flying a sight-seeing flight at just before seven P.M. on Wednesday he saw a sudden flash of light and then a new rift opened up before his very eyes. “This happened suddenly and five minutes later a rift appeared, about 100 meters long”, he said. The split went south towards the other crater. The new rift is not in the same direction as the old one, this one goes from north to south”. The new row of up to seven craters is closer to Thórsmörk and came up in the middle of the flowing lava forming the “lava fall” into Hvannárgil. “We did land on a hill a few hundred meters from the crateer to allow people to take pictures, but we didn not stay long. I deemed it safer to take off again and land at Hótel Rangá”, Jón Kjartan Björnsson said. טייס שטס בטיסה מעל אזור הפעילות הגעשית דיווח כי חזה במו עיניו כיצד נפער בקע חדש ופרצת ממנו לבה. After a new crater formed on Fimmvörduhals on Wednesday night, the site was closed to all traffic. One tourist described the atmosphere like “we were in the Viet Nam war up on the mountains. Suddenly four helicopters appeared,” geographer Kristinn Gardarsson said to mbl.is. He had planned to drive from Thórsmörk last night, but was ordered to stay in the hut at Básar. More than a 100 people were at Básar when police decided to transport all who wished to leave out of the area. Rivers had started to grow and travel to the area is not deemed safe. Gardarsson was not experiencing his first contact with eruptions. The Westman isles eruption in 1973 started a few hundred meters from his bedroom window. This time it was even closer. He was about 200 meters from the start of the new row of craters. “People did not seem to realize that this could be dangerous.” At first it seemed like a very small lave stream from the ground, but grew fast. שיוצאת מהם. בלינק שמתחת לתמונה ניתן לראות בזמן אמת את ההתפרצות ממצלמות אינטרנט. shows the new crater along with the old one. Geologist Ármann Höskuldsson describes how he literally saw the new crater open up. He also says on the video that now the new rift has grown to the extent that he and the reporter should leave. The video comes from ruv.is. The new crater opened up at about 19.00 last night when many people were at the site and helicopters had to save some of them down to Thórsmörk. At about 8.30 this morning Iceland Review’s photographer, Páll Stefánsson, boarded a small plane and went on his way to fly over the new crater. Stefánsson has almost been living at the eruption site since the activity started 10 days ago. His 20 page photo spread in the next Iceland Review is nothing less than spectacular. The issue is devoted to the eruption and the Fimmvörduháls area, one of the most beautiful walking paths in Iceland. האדם שבתמונה צילם את ההתפרצות החדשה מקרוב, ובלינקים תוכלו לראות תמונות וסרטון שלו. Páll Stefánsson photographer has just landed in Fljótshlíd after flying over the new crater and landing on the glacier. He arrived at 7 o’clock this morning at the small airport near Múlakot farm but morning mist prevented the pilot on the two person plane to take off until 8.30. Stefánsson reports that the lava flow has increased considerably and the lava stream now forms an even bigger “lava fall” than before. The small plane landed on the glacier, allowing the pilot and his passenger a close-up view of the new crater. Even though the area is now closed to tourists Stefánsson said that he saw three people at the site. They seemed to be in good condition and well equipped. הצלם מהדיווח הקודם טוען שמפלי הלבה שנוצרים גדלו. Tourists have been flocking to the eruption site. Even though the walking paths are closed today after the new crater opened up many watch from afar in Fljótshlíd. Since today the walking paths are closed many are enjoying other sites in south Iceland, includin Seljalandsfoss, the waterfall you can walk behind, and the folk museum at Skógar. A few days ago the BBC sent its crew over the eruption. They hired a helicopter at Hótel Rangá and flew over the site. The video gives a spectacular indication of the natural forces at work. In an interview with icelandreview.com Hótel Rangá owner Fridrik Pálsson said that journalists from all over the world are following the exciting new development in the eruption. Many of the best photographers in Iceland have gone to the scene, including Ragnar Axelson at Morgunbladid, who went on a privte plane this morning like Iceland review's Páll Stefánsson. Axelsson's series is impressive. By some accounts up to 25 thousand people have already come to the eruption area. This morning famous Icelandic environmentalist and comedian Ómar Ragnarsson said on state radio that this was a perfect “tourist eruption”. Still, one must stress that the lava and ashes can be dangerous, not to mention the poisonous gasses that can fill small basins. Last night some of the most beautiful videos so far were taken by ruv.is cameramen. כאן תוכלו לראות עוד וידאו מההתפרצות, מה שכבר 25000 איש ראו פיסית במקום ההתפרצות. A few earthquakes were detected in the eastern part of Eyjafjallajökull between three and four o’clock. The quakes were not very big, the biggest just below 3 on the Richter scale. According to the Weather bureau this seems to indicate that there is still plenty of activity under the surface of the glacier. This would then be connected to the eruption in Fimmvörduhals. However, the eruption itself shows no sign of change. It should be remembered that when the new crater was formed yesterday there was no earthquake activity. The eruption in Fimmvörduháls seems to be stable. The dreaded Katla, a much bigger and more dangerous volcano, shows no signs of waking up. A Katla eruption would start major floods on the southern coast and might put many farms and the village of Vík in danger. A Katla eruption could also have very serious consequences for flight routes across the Atlantic. Yesterday some of the volcanic glowing ash and lava went up as high as 100 meters according to onlookers. Volcanologist Ármann Höskuldsson has been investigating the eruption. He said in an interview to ruv.is that he sees no sign of reduced volcanic activity. The beautiful lava fall has been more dazzling in the past few days than before. With the new crater opening up on Wednesday the lava flow increased. If is dangerous to go to close to the stream, and even if you stand more than 50 meters away you can feel the heat. There has been speculation on where the lava comes from. Geologist Olgeir Sigmarsson told Ríkisútvarpid that the stream seems to flow continuously from many kilometers down. Sigmarsson said that in the spring of 2009 earthquakes were measured as deep as 20 kilometers down. The lava might be coming up from very deep below. This is a rare occurrence, if indeed that is the case. ההתפרצויות עד כה נראות יציבות, אולם צופים ראו שהייתה התפרצות שנסקה לגובה של 100 מטר. One of the many photographers who have explored the eruption at Fimmvörduháls is Chris Lund an Icelandic photographer in his thirties. He is the son of Mats Wide Lund, one of the best known Icelandic photographers. Mats travelled around the country in an airplane and his collection of areal photos of farms is of historic importance in Iceland. בלינק שמעל תוכלו לראות תמונות מדהימות של ההתפרצות הגעשית. here. This item we saw at the Earth Observatory at NASA. Lava continues to pour out of two fissures near Eyjafjallajökull as the eruption near the Fimmvörduháls Pass enters its third week. This satellite image shows the eruption on April 4, 2010. The original fissure—originally about 1,000 meters (3,000 feet) long and composed of several distinct vents—has coalesced into a single vent. The new fissure is hidden under a volcanic plume, likely composed primarily of steam. Black lava flows reach several kilometers north from the vents, eventually spilling into Hvannárgil and Hrunagil Canyons. This image was acquired by the Advanced Land Imager (ALI) aboard NASA’s Earth Observing-1 (EO-1) satellite. בלינק שבכותרת תופנו לאתר נאס"א שבו תוכלו לצפות בתמונות לווין של ההתפרצויות השונות וגם העתידיות. and search and rescue crews are searching for two women and one man who drove through Fljótshlíd in south Iceland in a blue Honda SUV with the registration number R 532 towards the volcanic eruption on Sunday. When the people’s relatives hadn’t heard from them last night they notified police of their disappearance. Police and search and rescue team members have searched the area around Mt. Thórólfsfell but have found no trace of the tourists, visir.is reports. If anyone knows of their whereabouts, they are asked to contact the police. According to Morgunbladid, many emergency crew members were on watch at the eruption zone throughout the entire Easter weekend. Chairman of the Association of Icelandic Search and Rescue (ICE-SAR) Sigurgeir Gudmundsson said the government should consider covering part of the cost for guarding the safety of tourists traveling to see the eruption. A storm is currently raging on Fimmvörduháls and in the surrounding area, which is not expected to calm until later this week. דווח על היעדרותם או היעלמותם של 3 אנשים באזור ההתפרצות, גבר ושתי נשים וצוותי חילוץ יצאו לחפש אחריהם. An earthquake measuring 3.7 on the Richter scale hit the eastern Eyjafjallajökull glacier near the crater on the Fimmvörduháls mountain pass at 3:32 pm today. 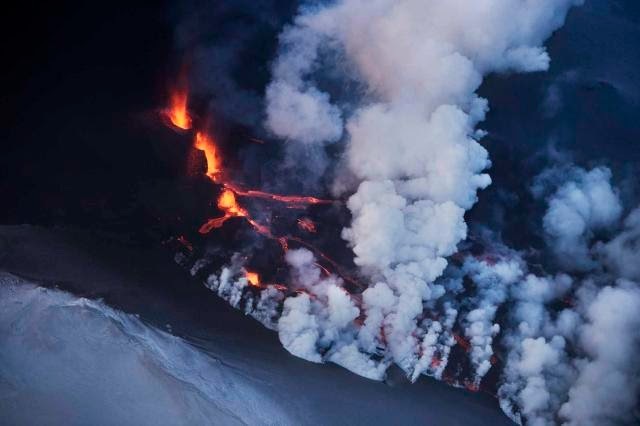 Geophysicist Einar Kjartansson at the Icelandic Meteorological Office told ruv.is that the earthquake is not a sign that the larger and more dangerous volcano Katla, which hides underneath the Mýrdalsjökull icecap, is about to erupt. Kjartansson explained that the epicenter of the earthquake is in the area where most of the earthquakes that are related to the current eruption have occurred. Most of these earthquakes have occurred at a depth of ten kilometers but this one is shallower—its source is at a depth of no more than three kilometers. The earthquake hit where geophysicists assume the eruption channel lies and it may have been triggered by the heat from the eruption. The earthquake could easily be sensed in Hvolsvöllur and in the Fljótshlíd countryside. In other eruption news, one of the missing tourists who went to see the eruption on Sunday has been found. The woman was cold and exhausted but no other information has been released. Search continues for her two traveling companions. דווח על רעידת אדמה חזקה שהתרחשה באזור ההתפרצויות וככל הנראה זה היה סימן לבאות כפי שתקראו בהמשך. A woman who went to see the volcanic eruption in south Iceland on Sunday evening with two other tourists was found dead today in the afternoon. Another woman was found alive earlier today but the man they were traveling with is still missing. The three tourists were reported missing yesterday evening. The man, who was driving, had contacted emergency services around 2 am on Sunday night and said he was lost, mbl.is reports. Police and emergency crews launched a search, but in vain. They were in telephone contact with the man the entire night, who said he could see the eruption but was otherwise at a loss for where they were located. His SUV was stuck. Around 6:30 am yesterday morning the man reported that he had managed to free the car and found a trail. He wouldn’t accept any further assistance. When the people didn’t return home yesterday their relatives contacted the police again and a new search was launched. Around 120 emergency team members from south Iceland and the capital region are participating in the search on cars, ski-doos, by foot and with the help of dogs. A Coast Guard helicopter was also involved in the search at one point. First one of the women was found alive. She was cold and exhausted but is now recovering. Then the car was found empty and shortly afterwards the body of the other woman was discovered not far from the vehicle. A 55-year-old man, who was reported missing after traveling to see the eruption in the southern highlands on Sunday evening, was found dead last night. The body of a 43-year-old woman, one of his traveling companions, had already been found. The third missing tourist, a 33-year old woman, was found alive. She was cold and exhausted but otherwise in good health and has been discharged from hospital, Morgunbladid and Fréttabladid report. The people drove towards the eruption zone on the Fimmvörduháls mountain pass in a Honda CRV SUV through Fljótshlíd on Sunday evening and are believed to have been on their way home when they got lost. Around 1 am on Sunday night the driver requested assistance from search and rescue. At that point they were probably located in the mire by the Tröllagjá rift, near the Gilsá river, on route F261. Police and search and rescue crews searched the area for five hours but didn’t find any trace of the missing tourists. The people were in constant telephone connection with the police. At 6:30 am the man reported that his car, which had been stuck, had now been freed and that he had found a trail, which he thought would lead them back into Fljótshlíd. Instead, it seems to have lead them further into the highlands. Around 2 am on Monday night the people’s relatives contacted the police again because they hadn’t heard anything from the travelers and were concerned that they might still be lost. An extensive search was launched. At one point as many as 270 people participated in the search and a Coast Guard helicopter was called out. The helicopter was used to transport the woman who was found first to hospital in Reykjavík and to transport the body of the other woman. After 5 pm the flying conditions worsened, so the helicopter could no longer participate in the search. From then on the search continued in cars and ski-doos, on foot and on telemark skis. Search dogs were also used. The search area is a lava field, which is very difficult to cross. In the early afternoon yesterday, the 33-year-old woman was found walking on the Emstruleid route, F210, near Mt. Einhyrningur. Later in the afternoon, the car was found empty and out of gas, nine kilometers away from where they woman was found. The body of the 43-year-old woman was found in a 700-meter distance from the car. Search continued for the man, whose body was found around 9:30 pm, five kilometers away from the car. According to Fréttabladid, when the travelers had driven more than 30 kilometers to the northeast, towards Emstrur, the car ran out of gas. People familiar with the area say it is unbelievable that they made it that far in an SUV. There is no telephone network in the area, the people were not equipped for walking outside in winter highland conditions and they had hardly any supplies. Around mid-day on Monday the man decided to seek help on foot. The women left the car one by one yesterday morning. The identities of the deceased have not been revealed but they were both Icelandic, as is the woman who survived the ordeal. צוותי החיפוש מצאו את הנעדרים ומתוכם אשה אחת והגבר לא היו חיים. There is significant activity in the new volcanic crater on Fimmvörduháls mountain pass in south Iceland while the original crater has ceased spurting lava—for now, at least. However, the lava still seethes in the older crater. Seismologist Ármann Höskuldsson at the Earth Sciences department of the University of Iceland, told Morgunbladid that a broad lava stream now extends to the west of the Hvannárgil canyon and flows one or two kilometers per hour. A team of nine scientists from the Earth Science department went to Fimmvörduháls yesterday to take samples and measure the spreading and thickness of the lava flow. Höskuldsson said blue volcanic fumes extend from the older crater but there are no explosions. That is an indication that the crater is cooling down. Yet aerial pictures show that there is still a seething lava pool within the closed crater. “There is quite a lively activity in the new crater and a lot of lava that flows from it,” Höskuldsson said, adding there are no indications that the eruption is about to stop. “It was expected that the old crater would go silent as the new crater lies at a lower altitude where it is easier for the magma to reach the surface,” Höskuldsson explained. דווח כי מקום הפעילות הגעשית הראשונה נרגעה והפעילות בא היא קטנה מאוד וחלה התקררות מסויימת של הפעילות במקום. The new hill or mountain that has formed around the original volcanic crater on the Fimmvörduháls mountain pass in south Iceland has grown 82 meters since the eruption started on March 20. The summit is in a 1,067-meter height above sea level. This information was revealed in the summary of a study undertaken by Freysteinn Sigmundsson and Eyjólfur Magnússon at the University of Iceland’s Earth Science Institute, ruv.is reports. The scientists used an altimeter and a GPS monitor to measure he mountain’s height. They also found out that the lava now covers an area 1.3 square kilometers in size and that it is ten to 20 meters thick. A total of 24 million cubic meters of volcanic material had been spurted out of the two craters at the time of the study. On average that is 15 cubic meters of lava per second. דווח כי ההר החדש המופיע בכתבה הקודמת התרומם לגובה של 82 מטר מעל פני הקרקע ובסה"כ גובהו כ- 1067 מטר מעל פני הים, והלבה מכסה שטח של כ- 1.3 קמ"ר ועובייה הוא כ- 20 מטר. In this video we see a lava lake in the crater. The lava is thin when it comes out of the earth, but has been thick and flows slowly from the crater. This new video from RÚV television shows the floating lava in the crater. The item is about research by Icelandic scientistics into the eruption. The pictures you want to see begin after about 1.02 minutes. The link is here. בלינק שמתחת תוכלו לראות ולשמוע דיווח על היווצרותו של אגם לבה ליד ההתפרצות בבקע החדש שהחל כתבה זו. The Icelandic Civil Protection Department decided yesterday to lower the preparedness level by one point, from emergency to danger level, because of the volcanic eruption on the Fimmvörduháls mountain pass in south Iceland. Activity at the eruption site has gradually been decreasing in the past days. The craters no longer spurt lava into the air, as aerial pictures that were taken yesterday confirm. There is now only a faint glow in the center of the craters, Morgunbladid reports. GPS measures show that the uplift of land which occurred before the eruption has gone back to normal in some areas. However, geophysicists say it is too early to declare that the eruption is over. History shows that volcanoes can cool for a while but then start erupting again, as in the case of the 1963 underwater eruption which created the island Surtsey. The eruption on Fimmvörduháls is considered similar in character to the Surtsey eruption. There are still limitations on traffic in the eruption area. No one is allowed to enter the actual eruption site within a one-kilometer radius around the crater. All traffic on the Eyjafjallajökull glacier and in the canyons where lava has flowed, Hrunagil and Hvannárgil, is banned. החשש מרעידת אדמה או פעילות געשית נרחבת הצטמצם, אך מאידך ידוע כי מקום של התפרצות געשית יכול להתקרר לתקופת מה ואחר כך לחזור ולהתפרץ במלוא עוצמתו, כמו שתראו בהמשך. Gudmundur Hilmarsson, a pilot at Cargolux, who flew over the volcanic eruption site on the Fimmvörduháls mountain pass in south Iceland at noon today, didn’t see any signs of continued volcanic activity in the area and he couldn’t spot any lava flow either. Hilmarsson told visis.is that he had looked into the two craters but couldn’t see any magma and everything seemed solidified on the surface. The pilot only saw a few jets of steam here and there and clouds of steam in the Hrunagil canyon where water seems to be flowing out from underneath the lava. According to geophysicist Magnús Tumi Gudmundsson, the volcanic eruption is most likely over. However, a “death certificate” cannot be issued before “the patient has definitely passed away” and it is too soon to tell whether the eruption will resume, he said. Two teams of scientists are currently walking towards the eruption area from the highland valley of Thórsmörk. One of the teams is planning to hike up the Morinsheidi heath and look at the craters and lava from there and the other is headed for Hvannárgil to look at the lava in the canyon and study the outflow of gases. טייס דיווח על פעילות געשית מצומצמת במקום ההתפרצות ושני צוותים של מדענים נעים לכיוון מקום ההתפרצות מכיוון שמורת פורסמורק. Breaking News: New Eruption Starting in Iceland? Two airplanes flying over Eyjafjallajökull this morning indicated that smoke is coming up in a new place to the south west of the eruption in Fimmvörduháls. This might be the beginning of a new eruption, much more dangerous than the previous eruption. Yesterday scientists indicated that the eruption in Fimmvörduháls might have ended.